AIM Altitude is one of the leading global suppliers of cabin interiors to the world’s leading airlines and OEM’s including Boeing, Airbus, the UK Ministry of Defence and manufacturers of regional aircraft. AIM Altitude has a long history, dating back to the early 20th century, of providing innovative, design-led solutions. Beginning as independent companies, the different parts of the Group have grown together to share knowledge and expertise. Altitude Aerospace Interiors formed when the design engineering department was separated from Air New Zealand’s Technical Operations to create a standalone design engineering business. 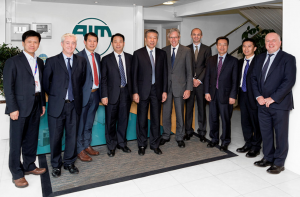 AIM Aviation (Fliteform) Ltd Heathrow merged with AIM Aviation (Jecco). At this time it was the oldest continuously maintained CAA Design Organisation approval in the world. Jecco founded in Bournemouth under the name John E Clarke and Company Ltd, a coach and car trimming business designing car hoods, coachworks and other products for the then UK Ministry of Defence. Henshalls founded in Byfleet making milk churns, amongst other products.